Powering the growth of U.S. manufacturing with TITANS of CNC: Academy. Get ready for your shop to BOOM! Yep, things are getting pretty exciting here at JobBOSS right now. We’ve just released our industry-leading JobBOSS 2018 ERP software. And now, we’re launching a dedicated ERP software training program in partnership with the TITANS of CNC: Academy - the incredible free learning platform set up by U.S. manufacturing champion Titan Gilroy, owner of TITANS of CNC, creator of the TITAN OF CNC reality TV show and JobBOSS customer. Gilroy’s vision is to inspire a new generation of manufacturing shop and worker. His Academy offers a free educational program packed with real world projects, video tutorials and TV episodes. The aim? To help businesses like yours fill the skills gap by training up your own workforce in your shops and wider communities. And it’s already having a real impact: the Academy welcomed over 30,000 members in less than 12 months. TITANS of CNC, a specialist manufacturer of parts for the aerospace industry, has just upgraded to the latest version of JobBOSS 2018 ERP software. And he’s so blown away by the way ERP software dials up efficiency, performance and profitability across his 15-person shop, he wants to spread the word. Well, we hear you Titan. We’ve always been completely on-board with anything that helps SMB manufactures grow and succeed. 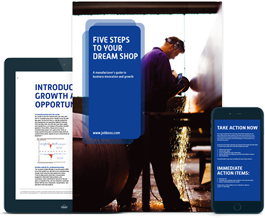 So we’ve been getting to work on free, dedicated content to showcase best practices for using ERP software in manufacturing job shops. So what does Titan have to say? 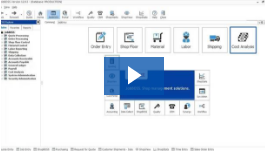 Our shop management expertise combined with Titan’s incredible free learning platform is set to be a real powerful combination that’s about to blow the world of ERP software wide open. Get real world guidance on growing your business with ERP software. Dial up the way you use JobBOSS to move your shop to the next level. Access free tutorials, ideas and expert insights. BOOM! And sure, maybe you’re new to it all and still wondering if ERP is the right move for your shop. So this is also where you’ll also find your ready-made ERP 101 to get all your questions answered: What is ERP? How does it work? What can it do for you? All free to view TITANS of CNC: Academy. So now we’re celebrating the launch of both JobBOSS 2018 and our partnership with Titan of CNC Academy by offering you a 10%* discount. If you’ve been thinking about using ERP software to move your shop to a higher level, there’s never been a better time. According to a recent third party study, “1/3 of ERP buyers did not even demo a product before buying it. According to a recent third party study, “28% of manufacturers report being unable to serve their customers as well as they would like due to a lack of functionality in their ERP system. Why do you need an industry specific ERP? A lack of visibility into your materials and parts is like doing business in the dark. Not sure what you have in stock, what’s on order or when it's due? You're risking a hit on your reputation as well as your profits. So if that’s the case with your shop, you need to take a quick look at JobBOSS Material and Inventory Control.